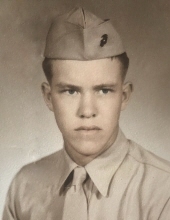 Celebrating the life of Charles R. Lamb, Sr.
Obituary for Charles R. Lamb, Sr.
Charles R. Lamb Sr., 75, of Churchill, Texas, passed away peacefully on January 18, 2019 at Michael E. DeBakey Veterans Hospital while surrounded by his family. He was born on January 14, 1944 in Prescott, Arkansas to Lloyd and Dorothy Lamb. Charles was a loving husband, father, grandfather, brother, uncle, Proud Marine and Bulldog fan. He spent his childhood growing up on his family’s home place in Prescott, AR with his 10 brothers and sisters. Being the eldest son, he took on a role of protector and care taker for his siblings. Considering the size of the family, you can imagine there was never a dull moment. Perhaps that’s what helped to mold his quick wit and sense of humor. At the age of 17 he made the decision to enlist in the U.S. Marines where he served for 4 years. From 1962-1963 he spent some time in Korea and the Philippines. He was also stationed at Camp Pendleton in San Diego, California where he was a rifle coach. He received his rifle training at Twentynine Palms, CA and was awarded the rifle marksman and pistol marksman badge. He was a tough and squared away Marine, something he was very proud of. During his time in California, he met his wife of 55 years, Sandra Lamb. They were married on January 18, 1964. After marrying, they relocated several times before making their home in Churchill, Texas. Charles and Sandra have three sons, who are their pride and joy. Whenever he got the chance, he would always brag about how lucky he was that he had such good sons. Charles had several jobs over his life including milk man, heavy equipment operator and truck driver, but his favorite pass time was watching his sons and grandson play football for the Sweeny Bulldogs. Even when his health started to deteriorate, he never missed a Friday night light if one of his boys were playing. You could see his chest swell with pride every time they walked out on the field or had their name called over the loud speaker. He also enjoyed the simple pleasures life had to offer. He loved dancing, fishing, mowing and working on his tractor. He was always happy to help a neighbor mow their yard or spread some dirt. When he became a Grandpa that gave him a new meaning. He loved his grandchildren and had a special bond with them. His blue eyes would light up every time they walked into a room and he would be waiting with his arms open for a hug. Charles surely lived life to the fullest through simple pleasures, a loving family and great friends. His sense of humor and charm will be missed by all who knew him. A memorial service will be held 11:00 am Tuesday, January 29, 2019 at Baker Funeral Home in West Columbia with Greg Pickering officiating. Interment will follow at 2:30 pm at Houston National Cemetery. Charles is preceded in death by his parents, Lloyd and Dorothy Lamb; siblings, Rita Crivello, Eddie Lamb, Shelia Lamb Stone, Dwayne Lamb, and Betty Lamb Welsh; and granddaughter, Aundrea Lamb. Left to cherish his memories are his wife, Sandra Lamb of Churchill, TX; sons, Chuck (Jennifer) Lamb of Sweeny, TX, Bobby (Melissa) Lamb of Churchill, TX, and David (Chrystal) Lamb of Angleton, TX; siblings, Fran Lamb Sikes of Breckenridge, TX, Doss Lamb of DeKalb, TX, Libby Lamb Sevier of Texarkana, AR, Carla Little of Fouke, AR, and Kevin Smith of Queen City, TX; grandchildren, Zac and Zoey Lamb, Chase and Karlee Lamb, Brittany and Cecily Lamb, Erica Fabrygel, and Jessica Land; special friend and adopted granddaughter, Matilde Gustaffson of Skoedstrup, Denmark; along with numerous cousins, nieces and nephews. To plant a tree in memory of Charles R. Lamb, Sr., please visit our Tribute Store. "Email Address" would like to share the life celebration of Charles R. Lamb, Sr.. Click on the "link" to go to share a favorite memory or leave a condolence message for the family.